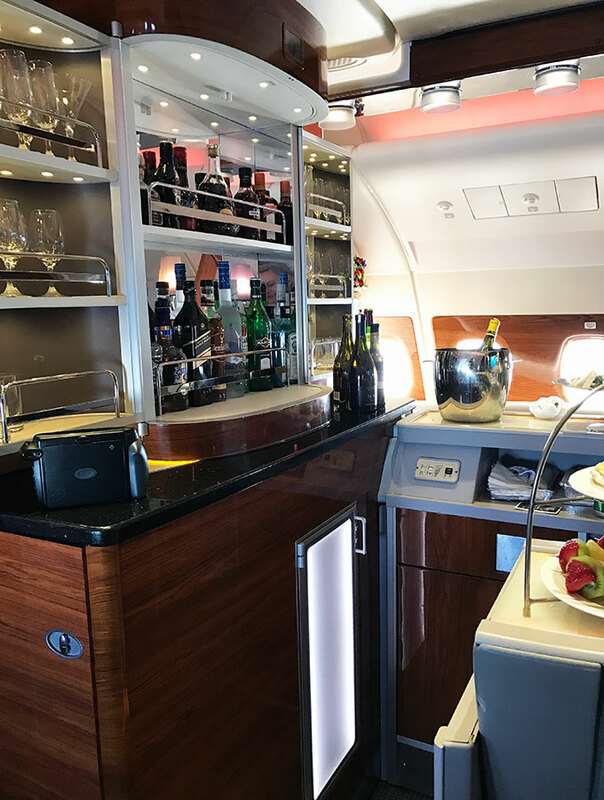 Ever wondered what the Emirates A380 inflight bar was like? Come fly with me and find out how the other half of the plane live. Ever since the Airbus A380 took to the skies, I have been excitedly reading how various airlines have been fitting out these double decker super planes. 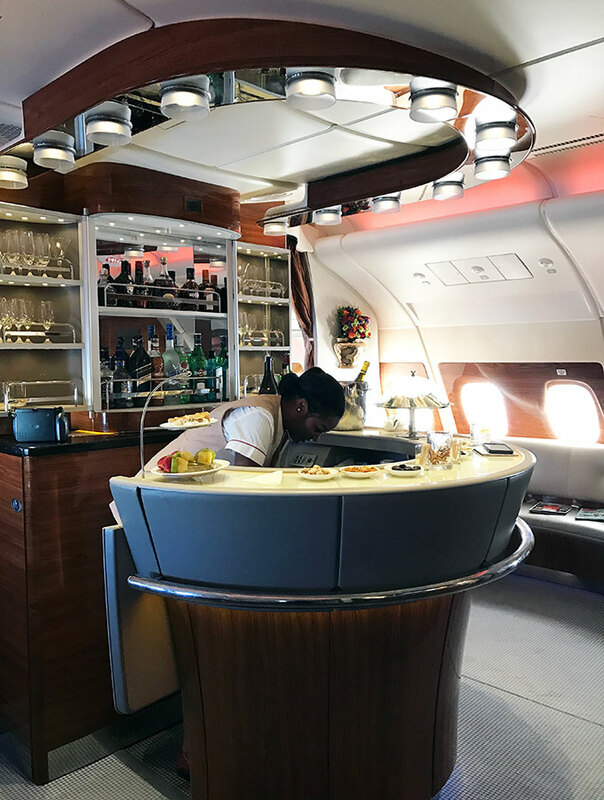 Like a few other airlines Emirates fitted their A380 with a bar. Is it just me? 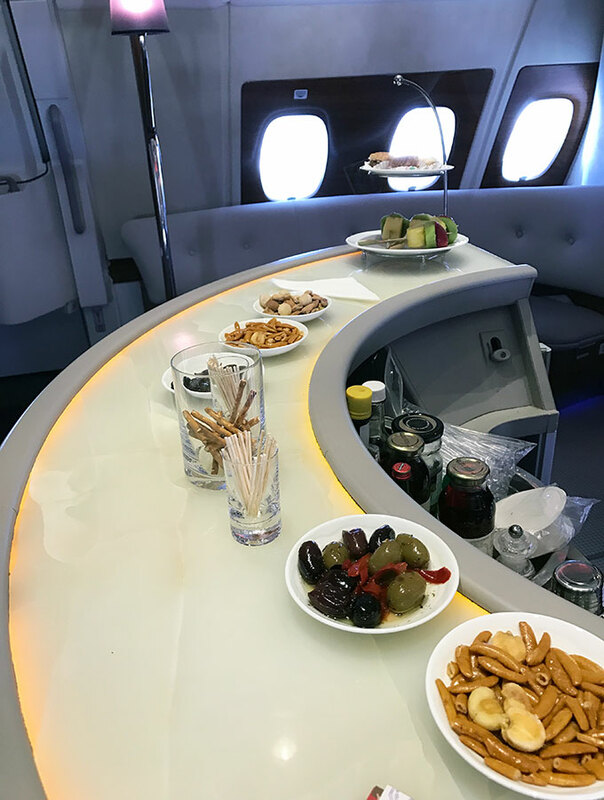 Or is there is something slightly exciting about having a cocktail bar/lounge on board a plane? 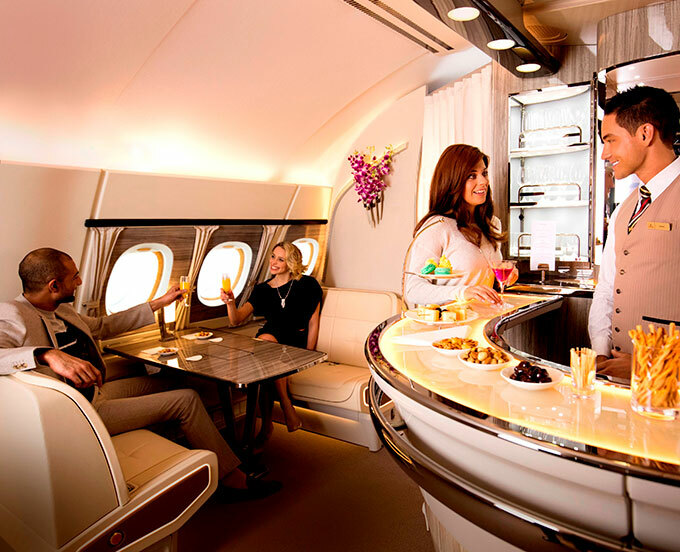 Unfortunately the Emirates A380 inflight bar is only available to those flying business and first class. If your seat isn’t on the upper deck, it’s access denied folks. My first drink from the bar was enjoyed in my seat. A dirty martin, stirred not shaken. 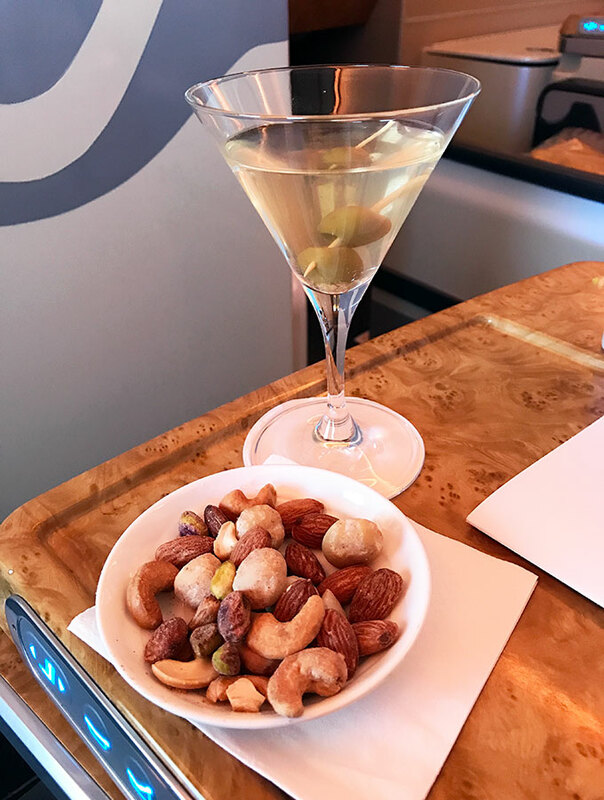 Served after take off with a premium nut selection. 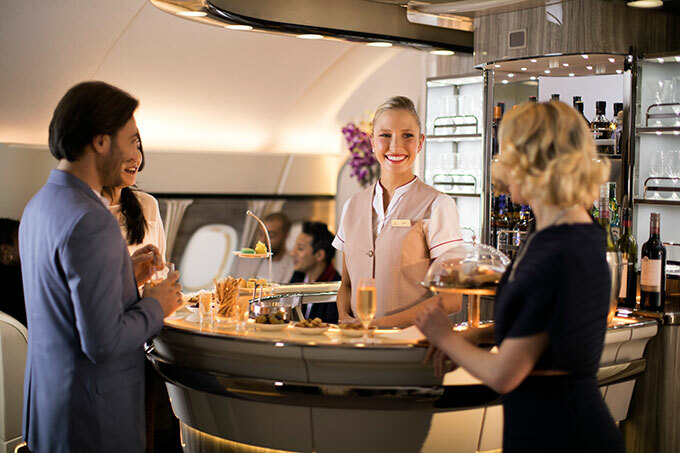 As enjoyable as seat service is when travelling business class, the fun of having a bar on board is visiting it. As I walked from my seat to the bar, I had similar feelings to visiting a bar by myself on the ground. Who would I find there? What will the bar tender be like? Would I be the only one? Will I find interesting conversation and a laugh? Or be ignored by the other passengers? I seriously over think things at times, and that five second walk was more stressful than it needed to be. The cocktail bar/lounge is located at the tail end of the plane. A space designed to entice you to stay and mingle with other passengers and crew. You will find a dedicated crew member behind the bar to make you a range of cocktails, pour you a glass of wine or champagne. If you are a business class passenger Moet is on offer. Flying first? Then they will bring down a bottle Dom Perignon for you to drink. The bar is the central focus of the lounge. 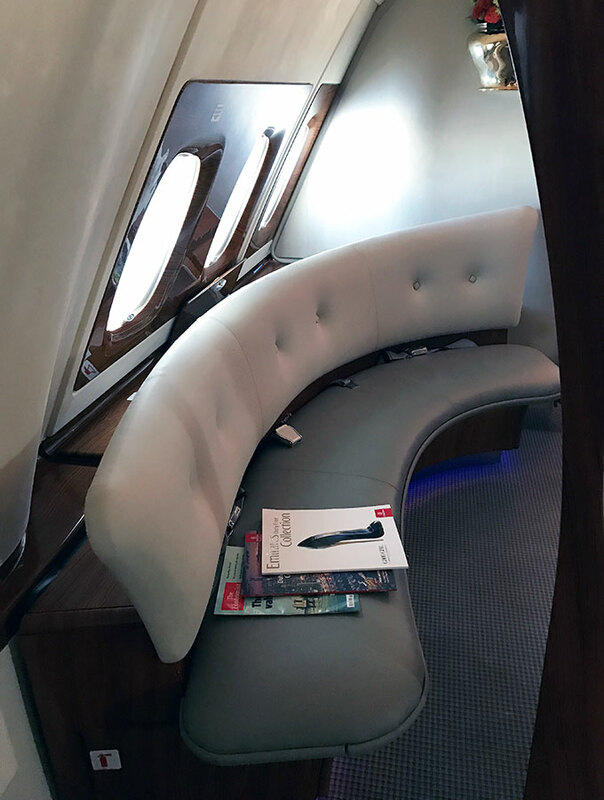 There are two long bench seats spooning the sides of the aircraft where you can sit and have a chat with your fellow passengers. Personally I enjoyed standing up and chatting with two other passengers around the bar. I did find company and a laugh! Besides having something to drink, there is food dotted around the bar. 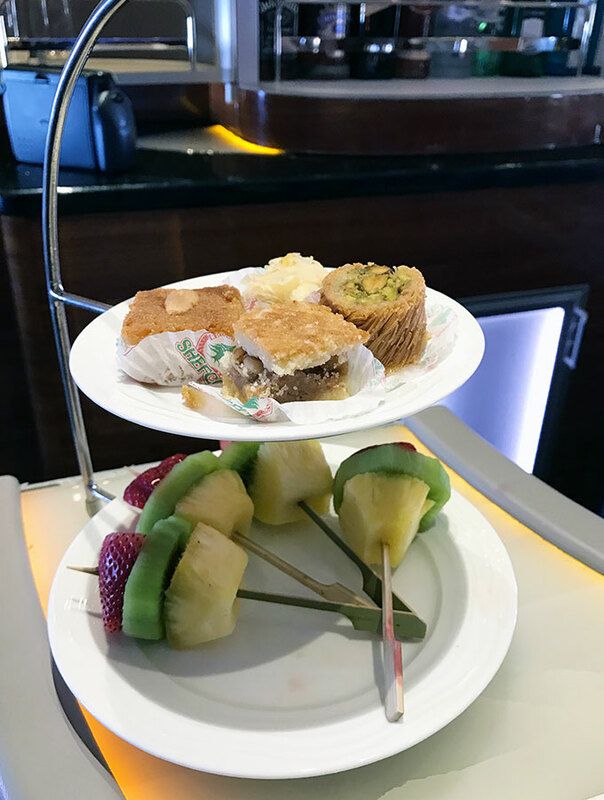 A variety of sandwiches, fruit and bar snacks to pick and choose from. On long haul flights there is a bar menu available. Over a rusty nail I chatted to my fellow passengers. One from first class sipping his Dom, and the other from business. 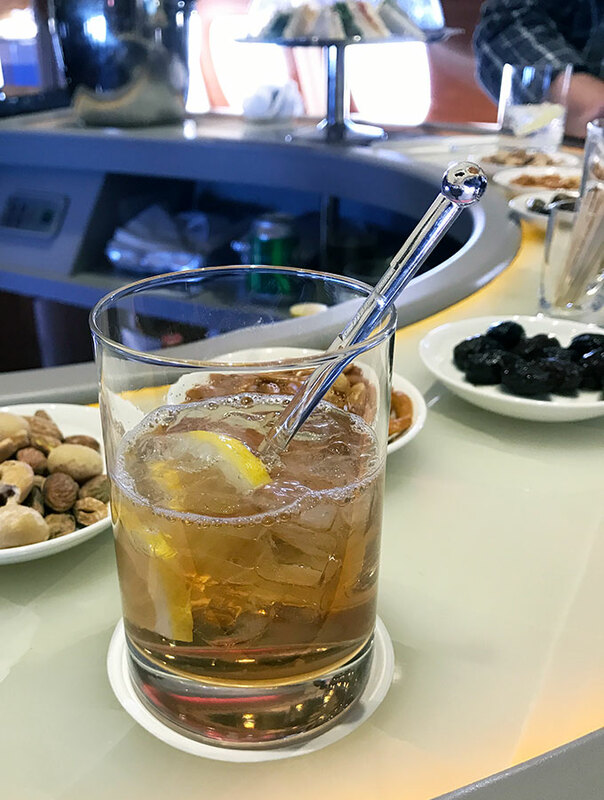 We swapped travel tales, general conversation and a laugh with the crew member behind the bar. I can see how the bar/lounge would be a welcome relief from your seat on a long haul flight. Before I knew it the announcement that we were getting ready to land was made. Where did the time go? Emirates are upgrading the bar/lounge area. Come July 2017 they will be rolling out a new saloon style bar. There will be more seating inspired by private yacht cabins, tables with views out the windows. The new lounge design will accommodate up to 26 passengers, 8 seated. It was the most social I have been flying solo in a long time. Normally I stick to my seat, but occasionally I chat to a crew member when stretching my legs or passenger when heading to the loo. 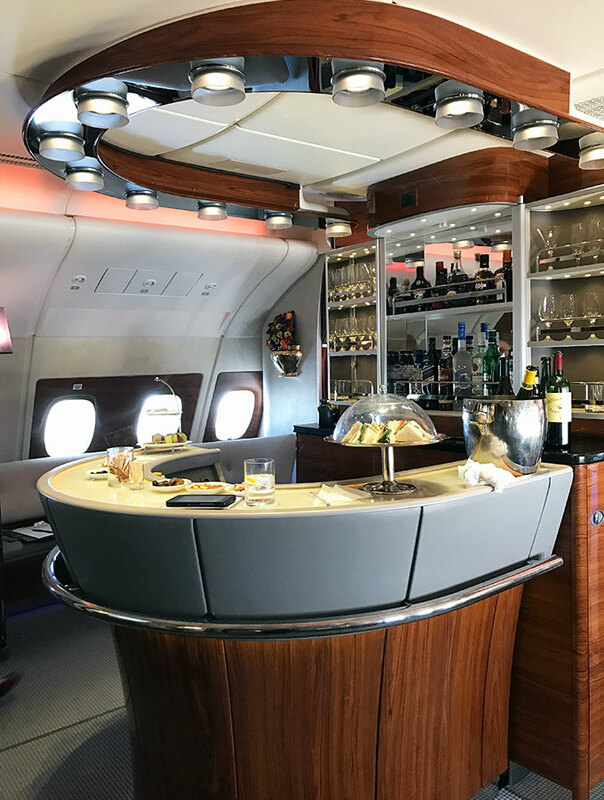 I’ve checked the Emirates A380 inflight bar off my list. Now I just need to wrangle my way into first class and try out the on board shower/spa! After more business class reviews? Read up on what Fiji Airways and Cathay Pacific have to offer. Or there was that time I was the only passenger on the plane. Not going to lie, that looks amazing. Reminds me of those vintage airline travel posters when flying was classic. So when you say they offer a range of cocktails, are they pre-selected of do they have the skills and tools for more than a 2 liquor max mix? 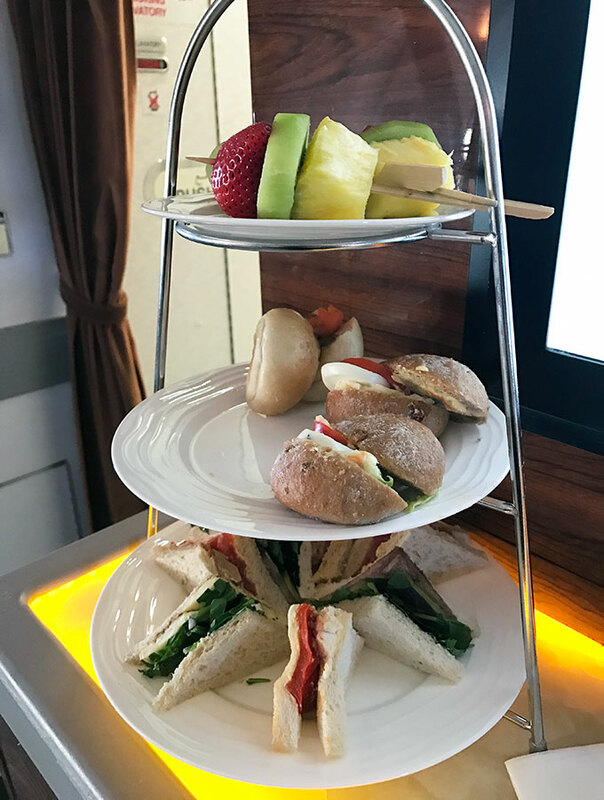 I had a friend fly an Upper deck of a British Airways flight and he used a ton of points for that upgrade. Did you? Eric it was a really cool experience. Normally I use points to upgrade, that’s basically the only way I use my points. This occasion I purchased the flight. It was a short flight from Sydney to Auckland, and I got my hands on a really great deal, which coincided with a double status points deal for my FF loyalty, it was just too hard to resist. Yep, love the idea of a bar on the plane, not just being served at your seat but going up and chilling at an actual bar! Like a party in the sky! Sadly my flight was just a short haul one. Would be such a great relief from your seat on a long haul flight from Australia. Totally party at the back of the plane. Oooo, I want to fly business class and check out this bar! I love the idea, definitely beats being confined to your seat the entire flight. It was so much fun just mingling and chatting to other passengers, and not while waiting for the toilet! 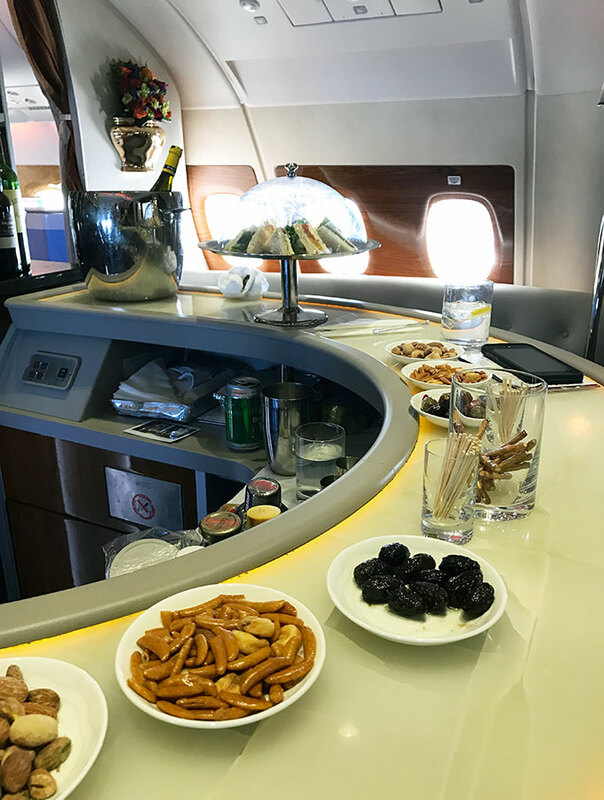 While I do not drink, I can certainly see how this bar would be nice for mingling with other passengers and grabbing some snacks or some fruit. Just the opportunity to stand up for a while and walk around a bit…or sit on a bench and stretch out a bit would be nice for the variety it provides on a long flight. They have a nice selection of mocktails for those that don’t drink alcohol. Which I thought was rather appropriate as not everyone drinks alcohol. Thanks so much Danik, it was such a fun thing to do. If only I could fly like that all the time!